#Stonehenge tunnel: point proved in Parliament? Actually, if you want to inflict zero damage on the World Heritage Site, length IS everything, there can be no argument about that. 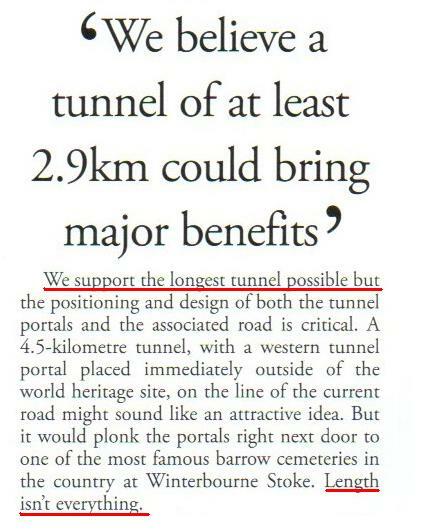 Instead, it seems as if the National Trust is proclaiming to the public that it supports the “the longest tunnel possible” but is actually arguing for a shorter one that emerges well inside the World Heritage Site, with all the damage that implies. Given the nature and historic role of the National Trust, that in itself is surprising, but coming at such an early stage such a stance seems astonishing. « Stonehenge tunnel: three incisive questions in Parliament!